It’s only mid-afternoon at the Cedar Extension High Rise for seniors on East 30th Street in Cleveland, but it smells like dinner time. Sixty-four-year-old Linda Brown and her 75-year-old neighbor, Queen Moss, are busy at the stove tending to a zesty marinara, while the meatballs they rolled bake on a sheet pan in the oven. In the dining room, at a counter with a view of the kitchen, a crowd of the seniors who live here gather for a real-life version of the Food Network. The show playing right now is called Recipe Re-Mix. That’s the name of restaurateur Susie Porter’s new venture. 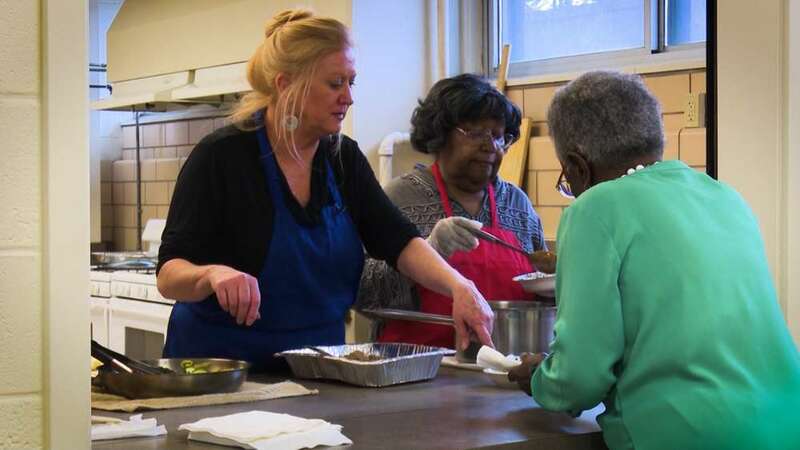 The lady once dubbed “The Queen of the Deep Fryer” because her restaurant, “The Town Fryer,” was known for frying anything, is now teaching the residents of this Cuyahoga Metropolitan Housing Authority high rise how to make the foods they love healthier. Today, that means turkey meatballs, a simple sauce with crushed tomatoes as the base and zoodles – zucchini and yellow squash cut thin with a spiralizer, in place of pasta noodles. Resident Larry Carter, 64, loved the healthier approach. That’s not an uncommon reaction in the months that Porter has been teaching at Cedar Estates. 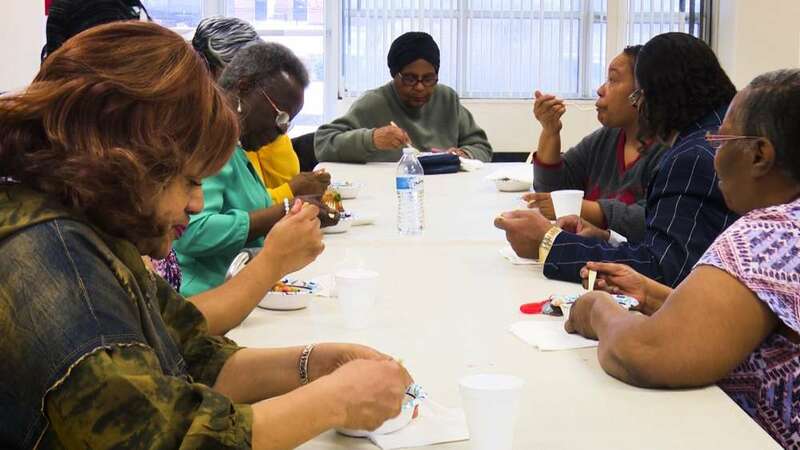 All of the seniors in the group – they call themselves the Pioneer Healthy Eating Club – describes personal health conditions that can improve with healthy eating. Chief among them, hypertension and diabetes. According to the U.S. Centers for Disease Control, the prevalence of diabetes and hypertension, or high blood pressure, is much higher in older African Americans than the rest of the U.S. population. Eating healthy will help Carter avoid complications, and stay alive. Delores Gray, president of the high rise’s local advisory council, was drawn to Recipe Re-Mix for a different health condition. How did the woman once dubbed “The Queen of the Deep Fryer” come to be teaching people how to make healthy food? For Porter, it began with a midlife decision to pursue higher education as her restaurant business, most recently housed in the Agora building, was winding down. She took classes at Tri-C and then Cleveland State University, and then applied for scholarships at prestigious Cornell University in Ithaca, New York. She was accepted into Cornell’s School of Industrial and Labor Relations at age 54, and aid and awards made attendance possible. She returned to Cleveland after getting her degree. Beyond the in-person demonstrations with clubs like the Pioneers, Porter is developing a web site with recipes and instructions for healthy eating. She is collaborating with the nonprofit Digital C, which is wiring CMHA properties for Internet with its “Connect the Unconnected” project. Porter has big plans for Recipe Re-Mix. She wants to make good ingredients more affordable so people will avoid heavily salted processed foods. She also envisions ready-to-cook meal kits with the right healthy ingredients or, one step further, heat-and-serve prepared meals for people who can’t cook or don’t have adequate kitchens. And Porter, who is set to become the local president of the Cornell Club, is using her college connections. She befriended many of her professors because she was around their age. They’re helping her with such things as food safety, dehydrating healthy foods to preserve them and even grinding spent brewery grains into a barley flower that’s more healthy than whole flour. She has a lot of ideas and just as much passion, and she’s serving up her message one meal at a time.